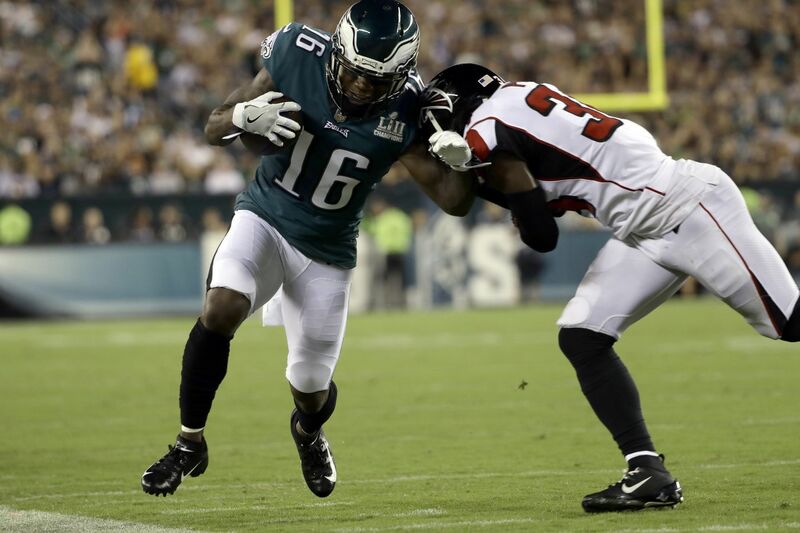 The Eagles completed nine passes to wide receivers in their season-opening victory over Atlanta, for just 43 yards. Eight of those receptions, for 33 yards, went to Nelson Agholor. The other was the first NFL catch for DeAndre Carter, a training-camp feel-good story whose 53-snap debut was pretty surprising for a guy who spent three previous seasons unable to make an NFL roster. Quarterback Nick Foles' 15-yard reception on the new Philly Philly play accounted for more yardage than any catch by an Eagles wide receiver. Add the three wideouts the Eagles signed to their practice squad Monday – Texans veteran Braxton Miller, ex-Falcon and Brown Reggie Davis, and former Jaguar Dorren Miller — to reports of former Ravens first-round pick Breshad Perriman and ex-Browns first-rounder Corey Coleman working out for the team, and one might infer that management and the coaching staff thought Thursday night's offensive struggles went deeper than Foles not looking sharp. Doug Pederson keeps saying Alshon Jeffery is close to practicing. Jeffery missed all of training camp and the preseason. Even if he practices this week, it's hard to see him playing this weekend at Tampa. Mack Hollins is on injured reserve with a groin injury. Veteran newcomers Mike Wallace and Markus Wheaton were not a factor in the opener, though Wallace played 66 snaps and was targeted three times. (He did draw one pass-interference penalty, and was clearly interfered with on another route.) Wheaton played two offensive snaps, one more on special teams. Shelton Gibson, coming off a strong preseason, played 22 of his 26 snaps on special teams, and had no role in the offense. "Just connecting on some of those deep passes – we knock those out, that's big plays in the game, big difference in the game," Wallace said Monday, when asked what he would like to see improve. "I've been playing a long time [10 seasons], I'm not panicking over one game. We'll be fine. Those big plays will come from everybody. … No one had the big plays they wanted – not myself, not Nelly [Agholor], not [tight end Zach] Ertz. Nobody. But we won. That's all that matters." Wallace said Atlanta's Cover 3 scheme made it difficult to complete long passes. "They have more of a Seattle-type defense. They do a good job of taking the big plays away," he said. "It's been a lot of guys in and out throughout training camp. A lot of guys down, a lot of guys up. It's just a timing thing," Wallace said. "You know, we've been all over the place as far as players just consistently – like, me working with Nick, Nelly working with Nick, whoever. Like, I've been out of practice, Nelly's been out of practice, Nick's been out of practice. We've been all over. We'll gel. I think we had a pretty good [practice] day today. We hit some of those deep shots that we wanted. Obviously, it was practice and not the game, but it's a start." Carter spent last season on the 49ers' practice squad. The year before, no one picked him up after New England waived him just before the season. Carter worked as a substitute teacher, and early in 2017, he was about to sign with the Canadian Football League's Calgary Stampeders when the 49ers called. Released by them this May, he had no camp invites until the Eagles signed him a couple of days into practice. "I just appreciate the coaches having that much trust in me, to have me be out there that much," Carter said on Monday. "Especially in a big game like that, close game like that. It was cool to be a part of." Foles targeted Carter just the one time, for 10 yards. Twenty-seven of Foles' 34 attempts were aimed at Agholor (10 targets), Ertz (10 targets, five catches) and running back Darren Sproles (seven and four). "As an entire offense, we've all just got to get on the same page, get clicking, get rolling," Carter said. "And we will." Zach Ertz and Nelson Agholor combined to catch 13 of the Eagles’ 20 pass receptions Thursday night. Miller headlined the Monday additions. Cut by the Texans when they trimmed to 53, he might be stashed on the Eagles' practice squad because he needs to learn the offense, and will join the roster as soon as that happens. He was the Big Ten Offensive Player of the Year in 2012 and 2013, as an Ohio State quarterback. He missed the 2014 season with a shoulder injury and in 2015 moved to wide receiver for his final college season. He played and tested well enough that the Texans drafted him in the third round in 2016. He caught 34 passes in 21 games over the next two NFL seasons, but Houston felt it had upgraded the position going into this season. Lots of NFL QB-to-WR conversions fail, or don't work out quite as well as projected. Pro wide receivers have to know a lot of nuance about body lean heading into cuts, leverage, proper spacing of routes, and many other things that you don't learn playing quarterback most of your life. Miller, 6-foot-2, 215, inherited the No. 89 jersey and the locker stall Monday of another such project, former University of Houston quarterback Greg Ward, who was released from the Eagles' practice squad Friday. Ward also began the receiver transition his final year in college. He has spent the last two training camps with the Eagles, but hasn't quite broken through. "There's always room for improvement as a receiver, technique-wise, blocking, stuff like that," Miller said. "Up and downs. I've had good moments, and I've had bad moments. Everything's a process." If nothing else, Miller would seem to be an ideal candidate for throwing the next variation of the Philly Special.